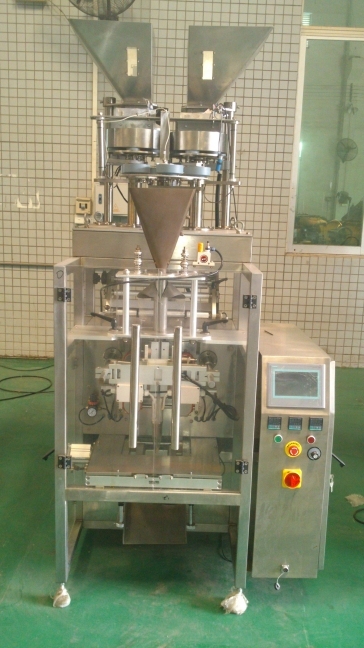 New Twin Hopper Granular Packaging Machine Model DCK4230-PV with New Product Hopper Elevator and New Product Takeaway Conveyor. This Twin Hopper unit is capable of filling two separate products into one bag. Comes with PLC Touch Screen Display, Servo Motor for drawing film into filling position, Horizontal and Vertical Temperature Controls for Various Types of packaging material. Technical Specs: Maximum Bag Length of 300mm (12”) with a Maximum Bag Width of 100 – 200mm (4” – 8”). Packaging Speed: 25 – 35 Bags Per Minute (depending on products being filled). Electrics: 220Volts/1Ph/60Hz. Delivery Time: Approx 8-9 Weeks from Receipt of 65% Deposit.